Steve Bonafel and One Iota will play at the Clifton Opera House on Saturday, July 23rd. This talented group took Ireland by storm last fall with their 10 day tour. They played pubs and clubs all over Ireland and returned with a world wide collection of new bluegrass fans. In September Steve will again be included in this year's IBMA SONGWRITERS SHOWCASE, a very prestigious honor. Come out and enjoy some of the songs that have made Steve an award winner. 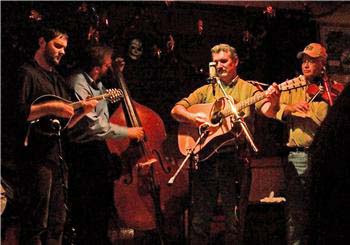 The band will be playing both traditional and original bluegrass. Steve's music ranges from hard driving ballands to slow heart felt stories about life. As a special treat, the audience will be a part of the making of their music video on Saturday evening. Join us and be a part of One Iota! Today the band consist of Steve on guitar and lead vocals, John Billerman on bass and vocals, Bob Bentle fiddle, and Brad Mienerding on mandolin and vocals. The Clifton Opera House is located at 5 So Clay Street in Clifton. The building is air conditioned and comfortable! Box office opens at 6:30pm, show starts at 7:30pm. Check the calendar on www.cliftonoperahouse.com for more information. Suggested door donation is $7.00. Tickets are available in advance by calling 937.767.2343.